The first Musical Opinion was published on October 8th 1877 and critically reviewed Brahms' new Second Symphony and in 1879 his Violin Concerto. In 1921 Musical Opinion launched its highly regarded sister magazine The Organ. The October 1936 issue carried an interview with Rachmaninoff and championed the young William Walton as Britain's most exciting young composer! New music, Composers, Concerts, Operas, Festivals, Dance, CDs, DVDs, Books, Operas, Opera Houses and Concert Halls are all examined in knowledgeable detail. This website will create the link between you and Musical Opinion. Read more about us on the Contacts Page. For details of our great value subscriptions please go to our Subscribe page. If you haven't seen a copy of Musical Opinion recently, contact us for a copy with our compliments (UK only). 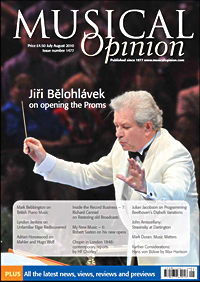 Each full colour edition of Musical Opinion includes many well-illustrated articles about composers, musicians, festivals, personalities and hot topics of the classical music world. To receive a sample copy without obligation to subscribe, simply send us your name and address (UK offer only). 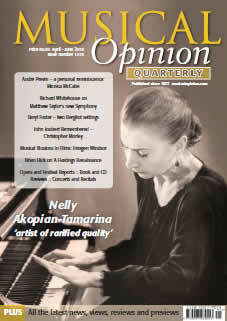 Musical Opinion Magazine is the leading quarterly magazine devoted to classical music, with an increasing circulation. Advertising in Musical Opinion can help you reach a highly relevant readership of music lovers, concert goers, record buyers and performing and creative musicians all over the world. We can offer print and online advertising options. Please download details of our print advert specifications (pdf format) and contact claire@musicalopinion.com for online advertising options or to place your advert today.